If you are someone, who is getting married soon then this article can be most important for you. For every bride, her attire value the most on her wedding day. But you can say that not many brides wear lehenga as they tend to prefer saree more. If you are enthusiast to try something different for your wedding then this can be the one stop destination for you. There are many varieties of lehengas available in the market. Like neon lehengas, fusion lehengas, jacket choli lehengas, long choli lehengas and many more. Today, I am going to write about different colorful bridal lehenga and choli combination, for a special occasion in your life. If you see closely, then you can find that a lot of heavy work is done on the hands of this amazing lehenga-choli. The lehenga consists of yellow as well as red border, but the choli have blue and gold in it. It can be your most wanted wedding attire combination and the added jewelry can give more glow in it. This beautiful lehenga-choli, have the combination of pink choli and blue lehenga with yellow dupatta. Though if you don’t find it attractive enough for your wedding, you can definitely wear them for your sangeet or even mehendi. Having the right amount of ornaments, you can totally rock with this glamorous attire. This lehenga-choli have the combination of blue choli and magenta lehenga. As this magenta colour is very rare for bridal wear, you can definitely wear them for your engagement. With proper makeup and beautiful jewelries you can look like the bride of decade. Well, who doesn’t look good at pink and this color have always been a trend among the brides along with red. Pink is the color of power, and it must always reflect on your attire too. This amazing lehenga-choli have purple as its choli colour and pink as its lehenga colour, with a little hint at the ground work of purple and gold in the lehenga it can make your attire truly stand out. If you are not into this one as wedding dress, then you can wear this for your sangeet or even haldi. Yellow has always been the colour of auspiciousness as well as purity. So you can fearlessly include yellow in your bridal wear, as it can reflect real beauty of every bride. 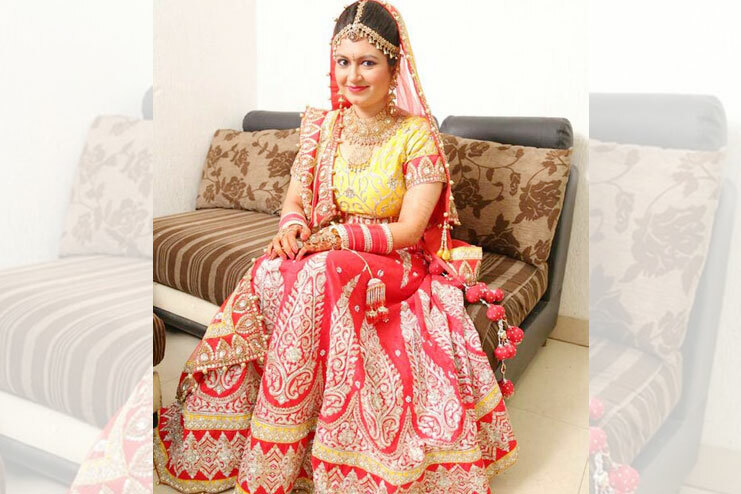 Just like the image, you can combine your red lehenga with yellow choli and with the hint of perfect jewelries as well as makeup you will look the most gorgeous bride ever. Do not miss on this lehenga ever! This lehenga-choli combination consists of red choli and green lehenga with pink border. You can definitely wear this beautiful lehenga-choli for your wedding without any hesitation. It can give the look of a stand-out bride. This beautiful lehenga have golden zari work all over the attire, which gives it the most royal style. But, do not forget to properly attire them with golden jewelries as well as makeup. This amazing and mesmerizing lehenga-choli is combined with pink choli, green lehenga and orange dupatta. What can be more elegant than this fully worked lehenga for your reception. Wearing this one can make you stand alone in the crowd and look amazingly beautiful. Have you seen anything more beautiful than sea-green and velvet? Then this lehenga-choli combination can really give you the look of your dreams. It has pink choli and blue lehenga which is made of velvet cloth. But the interesting fact is that the dupatta is made of sea-green and with the combination of proper jewelry as well as makeup can really give the award for the bride of the year. As I said previously, yellow is the color of auspiciousness. So, never fear out of wearing yellow in your wedding day. It has pink choli, yellow lehenga with big blue border and peach dupatta. Well this bridal wear lehenga is one of the best look for a minimalistic bride. Try to wear simple diamond jewelries with it. As diamond can really help you to reflect out your attire. This lehenga-choli is made up of yellow choli and green lehenga with brown in the ground work. It is a fully embellished zari work that is done very intricately. So, if you looking for something royal, then do opt for this one. As it has more to look for and more to enjoy for. Remember to adorn this lehenga with proper jewelries as well as makeup to make it look amazing. When looking for something exclusive, then you can go for this black choli, green lehenga with black border and pink dupatta. Well, maybe it can look too simple, then you can wear it for your engagement or for your reception party.